I loved Throne of Glass, it was one of my favorite reads of 2012 but after Crown of Midnight I was questioning whether this series was for me. I felt like a lot of the intrigue and badass-ness of Celaena was lost in Crown of Midnight there was a lot of sitting around and Chaol (I am not a fan of Chaol). I decided to read Heir of Fire though because I do so love Celaena and I wanted to see if things would change and boy did they change! Celaena if possible became even more awesome in this novel! Heir of Fire begins with her arriving in Wendlyn. Celaena is still nervous and concerned about her power and is desperate to talk to her fey aunt. There is a hitch in this plan though, in order to have a meeting with her aunt she must train her magic and she is given a tutor, Rowan. Rowan is my new favorite character! He is calculating, smart, and a true warrior. He is the type of tutor Celaena needed even if she didn’t really want him around. I liked how little secrets from both of their pasts were revealed slowly, it endeared you to both of them. While Celaena is training with Rowan Chaol and Dorian are back at the palace dealing with the King of Adarlan. Chaol is trying to discover why the magic disappeared and who his allegiance is to. His last few days with Celaena in Crown of Midnight haunt him. The friendship between Dorian and Chaol is strained in Heir of Fire to say the least. Alone, Dorian begins a new relationship and is also conducting research in to his own mysterious powers. 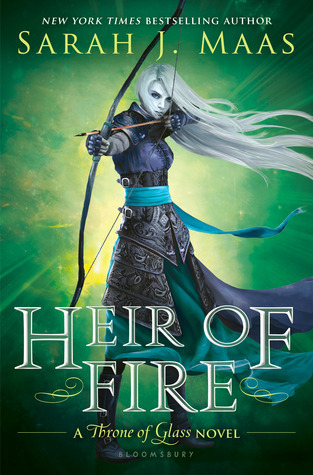 Overall, Heir of Fire restored my faith in this series. So many new things happened and I felt like Celaena got her “fire” back! The ending definitely left the novel heading in a direction I’m excited to read and I have super super high hopes that Arobynn, Celaena’s assassin trainer, will finally make an appearance in the series.